The Mantis-I Handheld Kit from Element Technica is a shoulder mounting solution for film and digital motion picture cameras. It includes a shoulder pad and dovetail, a crossbar, and a universal handle kit. 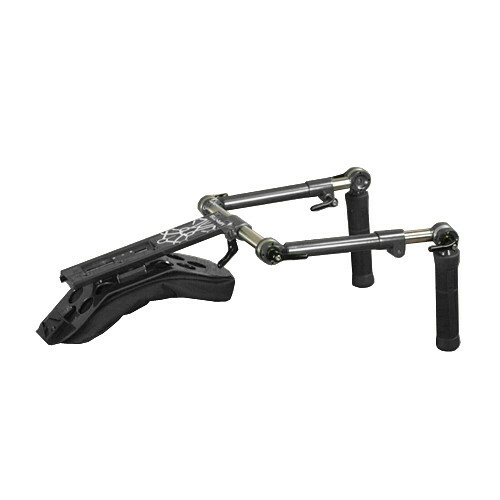 This kit includes both the left- and right-sided Elements Technica Universal Handles found on the Mantis shoulder rig. Both handles are telescopic from 9" to 14". They're ARRI rosette compatible and feature rosette-adjustable rubber handgrips. The levers are spring-loaded. Optional Mantis Handle Extension Kits are additionally available. Elements' Mantis Shoulder Pad and Dovetail is compatible with the Elements Mantis series. Elements' Mantis Crossbar is compatible with the Elements' Mantis series. Box Dimensions (LxWxH) 11.5 x 3.75 x 1.6"